Bandages of all sizes. They’re a quick and easy fix for accidents big and small. Keep a few stashed away for scraped knees and other owies. We suggest having a small first aid kit handy, including Lavender essential oil to cleanse and soothe minor skin irritations. Young Living Seedlings® Wipes. Kids can be messy. Keep your car and your kids clean with our gentle, lightly fragrant Young Living Seedlings™ Baby Wipes. They’re a great solution to any sticky situation. Thieves® Waterless Hand Purifier. We know kids are naturally curious and want to touch everything! Keep tiny hands clean with our Thieves® waterless hand purifier. Your favorite essential oil. Raising little ones is an exciting time, but the job description comes with chaotic days. At times it can feel like a workout just getting kids buckled in to car seats! Once you’ve had the opportunity to get in the driver’s seat, reward yourself and your kids with a deep breath of your favorite essential oil, like Stress Away™ essential oil. Try adding a few drops to a cotton ball and clipping it to an AC vent so the whole family can benefit from the fresh, soothing aroma. Flashlight. Having an emergency at night is the worst—especially because it’s tough to see. Make the situation less scary with a flashlight to help you get through it with ease. KidScents®. 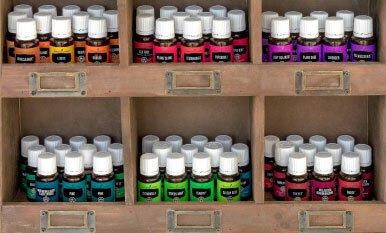 You never know when you’ll need to whip out the oils for your kiddos. Some favorites to keep in your compartment are Owie™, TummyGize™, and SniffleEase™. $20 bill. Forget your wallet? Keep some cash stashed in your car so you aren’t left stranded with your kids. Forgot the lunch money? You have a $20 in your kit! Extra clothes. Kids find a way to spill anything and everything on their clothes. Store an extra set in your back seat in case they need to change into clean clothes before going to Grandma’s house. Find some super cute Young Living gear for kids to stash in your car also! Diapers. Not only are diapers used for cute baby bums, but they can also double as drink-spill wiper-uppers, cleanup if someone gets carsick, or as a bandage if your kiddo gets hurt. Who knew they were so versatile? Sick bag. Sometimes kids get sick, and cars seem to be a favorite location. Avoid cleaning up your little one’s morning meal by keeping a sick bag close by. And in case they miss the bag, keep Thieves® Wipes on hand to clean up the mess. Deep Relief Roll-On. When you’re chauffeuring kids all day, you’re bound to get a stiff neck and muscle aches. Pop out your Deep Relief Roll-On™ for a soothing massage and enjoy the refreshing and cooling sensation on your neck and shoulders. Comfort toy. For fidgety little hands, it’s nice to have a distraction, especially during long rides. 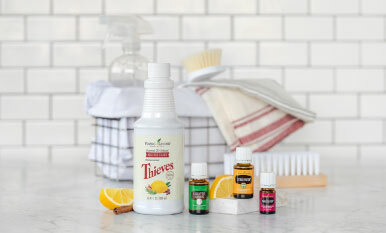 Bypass the screaming and kicking after a long day and give your tiny tots Young Living’s AromaSpinner™. It’ll help keep them entertained and you focused on the road. Snacks. Hunger pangs create fussy little ones. We suggest adding some Gary’s True Grit® Wolfberry Crisp™ Bars, crackers, raisins, and other healthy snacks to your kid-mergency car kit. Water bottles. Water is great for hydrating, but it’s also handy for washing dirty hands and feet, cleaning up spills, rinsing out sippy cups, and more. Keep a few bottles in your car kit—you’ll be grateful you did! YL Tip: No need to limit the powers of your kid-mergency kit to just your car. Keep some of the essentials—like snacks, a roll-on, oils, and wipes—in your purse for easy access no matter where you are! Whether you had an emergency or a smooth car ride, treat your little ones to our DIY bathtub crayons or diffuse some kid-friendly essential oil blends when you get home. What do you keep in your kid-mergency car kit?